We give an upper bound on the modulus of the ground-state overlap of two non-interacting fermionic quantum systems with N particles in a large but finite volume L d of d-dimensional Euclidean space. The underlying one-particle Hamiltonians of the two systems are standard Schrödinger operators that differ by a non-negative compactly supported scalar potential. In the thermodynamic limit, the bound exhibits an asymptotic power-law decay in the system size L, showing that the ground-state overlap vanishes for macroscopic systems. The decay exponent can be interpreted in terms of the total scattering cross section averaged over all incident directions. 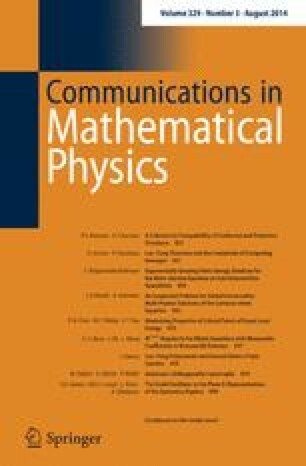 The result confirms and generalises P. W. Anderson’s informal computation (Phys. Rev. Lett. 18:1049–1051, 1967). Work supported by Sfb/Tr 12 of the German Research Council (Dfg).